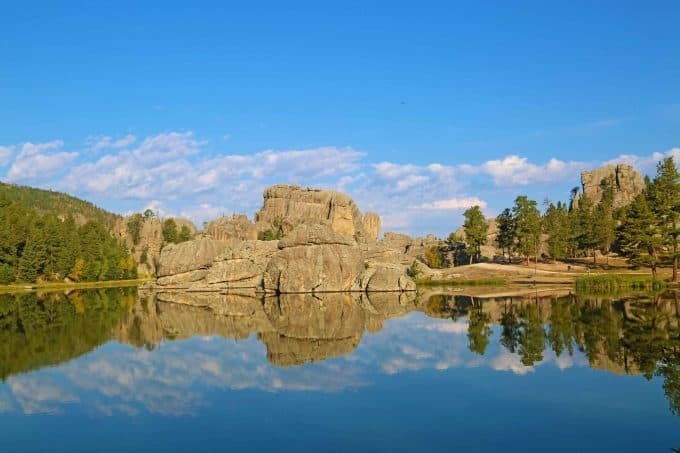 Sylvan Lake Lodge in Custer State Park has 67 rooms some of which overlook Sylvan Lake and offers great cabins. 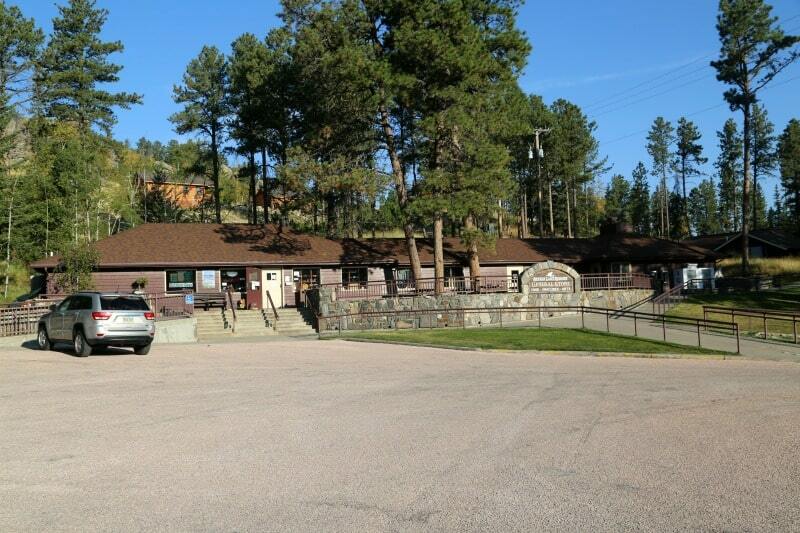 Sylvan Lake Lodge was built in 1937 with a new wing of rooms added in 1991. There are 31 cabins in the hillside surrounding the historic lodge. We stayed in Cabin #511 during our stay and really enjoyed it. The cabin was up a small set of stairs! If you have any knee or mobility restrictions make sure you let them know when you call for a reservation. The cabin was nicely furnished but not large. With two people sleeping in the bed one of us had to crawl over the other person to get in and out of bed. The bed was super comfortable. 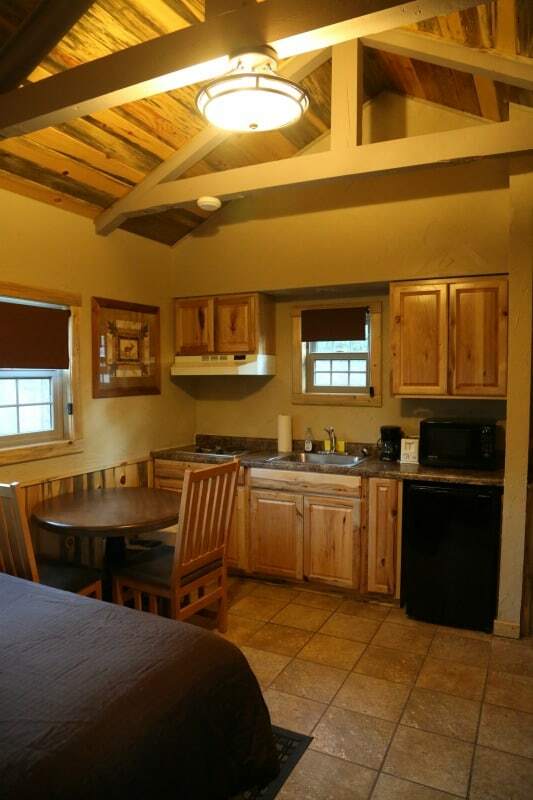 The cabin does have a small kitchenette with a mini-fridge, microwave, small stove top. This worked out so great for us. We had been driving for hours to reach the park and all we wanted to do was relax. We picked up snacks at the store and made microwave mac and cheese and sandwiches for dinner. 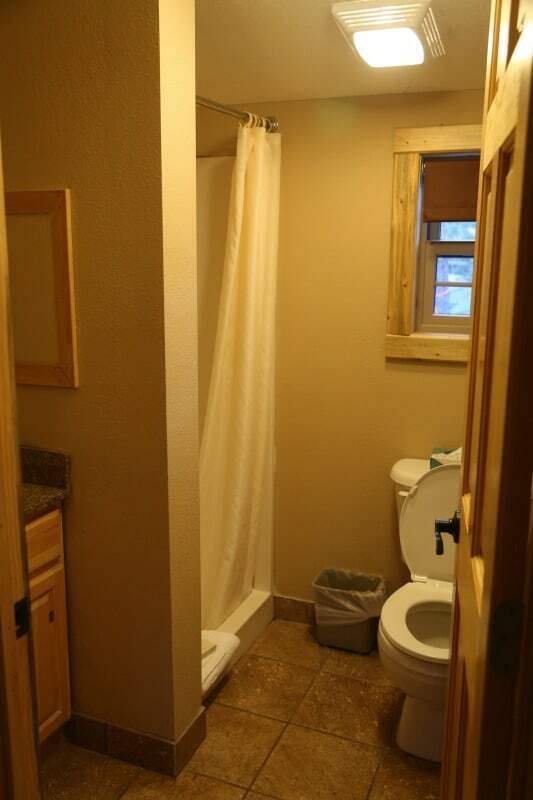 There was a bathroom in the cabin with a small walk-in shower and toilet. The sink was outside the bathroom. Outisde the cabin we had a picnic table and fire ring which would be great for making smores and relaxing. 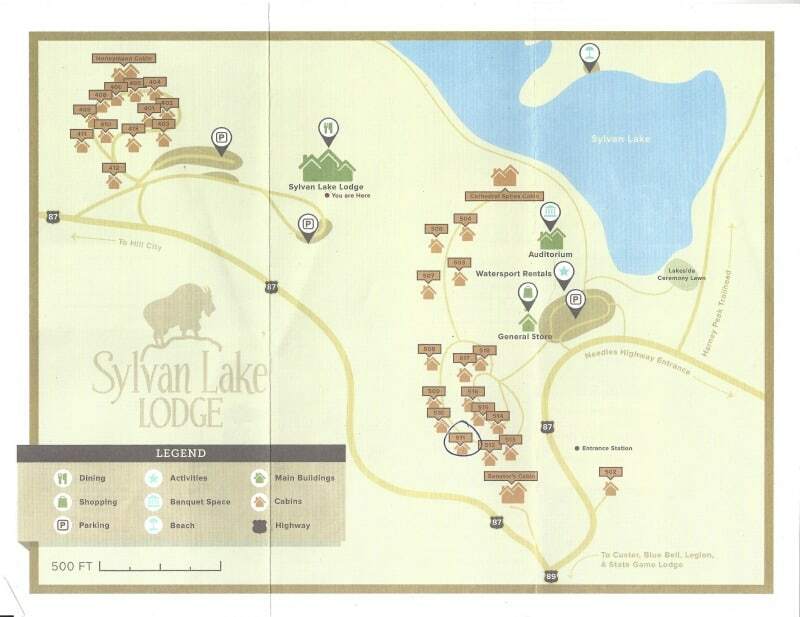 There are 32 cabins near Sylvan Lake Lodge. 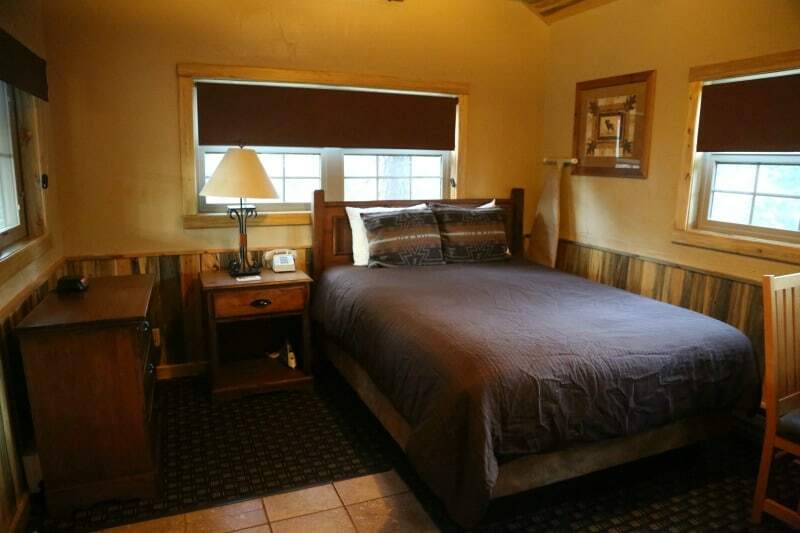 The Senator’s Cabin is five rooms with three queen beds, 2 sofa sleepers and can sleep one to ten people. 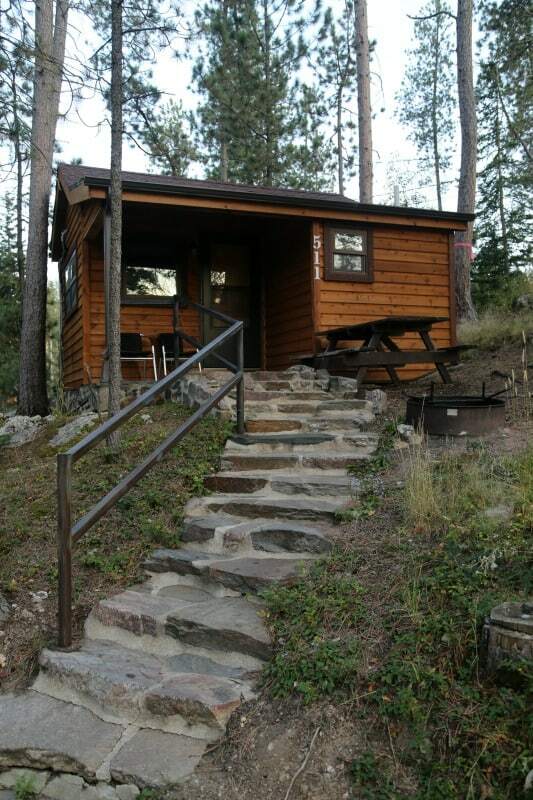 The Cathedral Spires Cabin is 4 bedrooms and 5 bathrooms. The cabin has 1 king bed, 5 queen beds, 2 sets of twin bunks, and two sofa sleepers that can sleep one to twenty-two people. 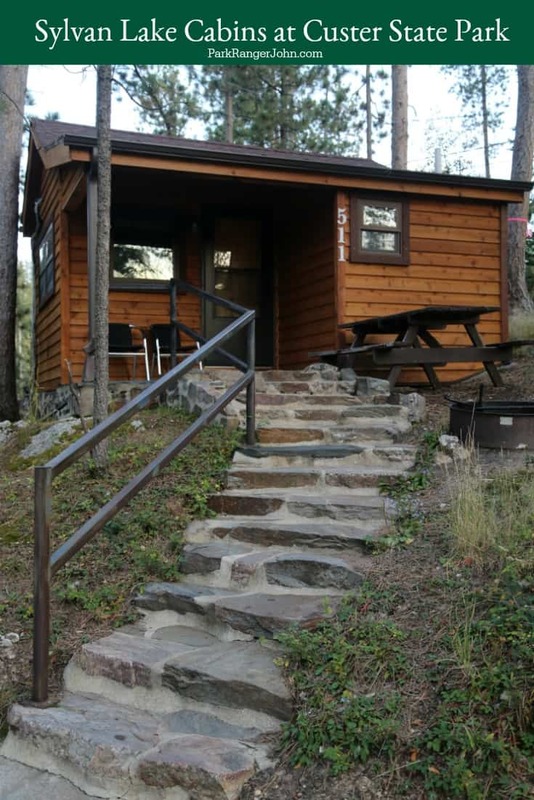 This cabin has a stone gas fireplace and deck overlooking Sylvan Lake. The general store has souvenirs, grab and go food, snacks, and books. We definitely suggest calling for reservations. The online system can get confusing and a bit overwhelming. You have to display a parking pass!!! Reservations are recommended! The bar closes at 10 pm. The general store has grab and go food including pizza, sandwiches, sides and ice cream.